Best-selling author Greig Beck forges thundering action tales filled with blood, bullets, bombs - and horrifying nightmare monsters! Find out about his life, his books, and what's next on the action menu! You come from the land of sun, surf, and dingos. What was your life like before you took up the pen, and what inspired you to pursue writing? Growing up there were lots of jobs, but my real career was in Information technology – first in computer programming, then systems analysis, and then with further study and armed with an MBA, moving into securities trading consulting, and then finally into company directorships. The role took me to most of the financial capitals of the world - from Hong Kong, London and Switzerland, to New York and back again. I’m still involved on the periphery of the industry today. I was always good at producing marketing documentation (now that’s fiction!). So I knew how to put descriptive words together. But one day I was reading a newspaper and came across a small item about some scientists preparing to drill into a buried lake beneath the Antarctic ice. They theorized that there could be life there that hadn’t seen the surface for a million years. It made me wonder – what could it be like? What if it’s more than microorganisms? What if evolution has taken a different path? The more I thought about it the more detailed the story in my head became. I started putting it down on paper, and I found the experience great stress relief from my hectic job. Before I knew it I had 80,000 words down. I polished it up and sent it of to Pan Macmillan – the rest is history! What are some books/authors that have influenced you? I know this is where I should list weighty tomes by authors with unpronounceable Eastern European names. Or perhaps even demonstrate how, as a well-rounded author, I dabble in a little Lithuanian poetry after dinner… but alas, I cannot. I have to be true to what I read and enjoy. Below are the real books that have influenced me, and still to this day, are the ones I may pull off a shelf in between new purchases. My favorite horror author. This story, and Masterton’s earlier works (such as The Manitou), has some of the most amazing and original terror scenes. This particular book has the killer first line of dialogue – ‘It’s my house. It’s breathing.’ Many of his stories, like mine today, have as their basis an underlying myth or legend. I read the entire series when I was about 14… then again at 18, and again at 25. The series was written by Burroughs almost exactly 100 years ago and follows the adventures of ex soldier, John Carter who is transported to Mars. He meets and falls in love with the beautiful Princess Dejah Thoris, and must battle monstrous creatures while saving the red planet. Like the writer’s Tarzan character before, John Carter came from a time when heroes were heroic. A rare short story from the 1950s. It was later turned into a movie (called The Thing) in the mid 50s, once more in the 80s and then just recently in 2011. Campbell’s description of the psychological breakdown of the men when trapped in the Antarctic while encountering a hostile alien creature is still very powerful, very claustrophobic, and very frightening. The 50s and 60s were a great time for monsters! I remember being in Basel, Switzerland on business, and being in a bookstore on a Saturday morning as they were putting it out on the shelves – I took it straight out of their hands! The story was so fantastic – the research, the characters, and the concepts – wow. I slept about 4 hours the entire weekend, and finished it just in time for work on the Monday morning! I’d like to start by thanking Alan for reminding us that aliens might not be all weird little turtles with lights on their fingers. From the moment the author had a crew pulled from hypersleep to touch down on the bleak planet LV426, it had me rapt. Mixed up POVs and a very small book, but one I have reread several times and each time can still feel the sense of dread, tension, and downright fear as they try and stay ahead of the creature running loose on board the massive mining vessel Nostromo. I saw the Rod Taylor movie when I was a kid, then read the novel. Since then I have collected many antique copies, marveling at the fantastic cover art designs. I also have the Easton Press edition with the missing chapter called the ‘Grey Man’. This fantastic tale influenced too many stories and authors to count. He gave us the term “time machine”, and also brilliantly explored the concept of divergent evolution – think Eloi vs Morlok. This work certainly inspired my Valkeryn Series. Wells gives us a story that is every sci-fi reader (and author’s) dream – science, fantasy, excitement and fun. Your Alex Hunter books blend mind-warping sci-fi, horror, and explosive action. Where did you get the idea for this character and series? I’ve always loved sci-fi, horror and both action books and movies. The inspiration for my stories comes from everywhere – the newspapers, television, movies, online, or just plain talking to interesting people. But the inspiration for the Arcadian character – for that, we have to look back just on 100 years! Exactly 100 years ago, just last year, Edgar Rice Burroughs achieved his first fiction sale. It wasn't to be his more famous Tarzan story, but a small work originally titled: Under The Moons of Mars, and released under the pen name, Norman Bean. His Barsoom series (his name for Mars) launched one of the most magnificent and prolific imaginations into the world. In 1917 the story was rereleased as The Princess of Mars, and I read and collected the entire series when I was about 14… then read them again at 18, and again at 25. Part sci-fi, part horror, part romance with huge helpings of action and adventure – it is a magical book. In the tale, John Carter, a Civil War veteran is mysteriously transported to the surface of Mars. But there he doesn’t find a planet that is dry, lifeless and filled with nothing but red-dust. Instead, it is a place full of monstrous green giants, four armed beasts of all kinds, beautiful red maidens, and a world and princess in need of saving. Added to this, on his new world he finds himself gifted with near super powers due to the difference in gravity (Carter’s leaps were the basis of the Superman character). John Carter came from a time when heroes were heroic, and fantastic adventures needed a fantastic character within them. The Barsoom series inspired a number of well-known 20th century sci-fi authors such as Ray Bradbury, Arthur C. Clarke, and Robert A. Heinlein. For those who like who new worlds, fantastic creatures, and adventures of the highest order, I urge you to read this. It was the inspiration for my Alex Hunter, Arcadian series, and one I still dearly love. What would you say is necessary in crafting a gripping action story? Educate yourself on how it is done and done well – this through the delightful experience of reading great books and watching movies to see how the authors build tension, deliver thrills, and do armchair-gripping horror. Even graveyard humor is done better by some authors than others. Also, keep it real. Sounds odd to say that from a fiction writer, but you need to watch the plausibility index – if your character is in a tight situation, don’t have him suddenly remember he’s wearing rocket boots and then fly away. Remember, sometimes the good guys lose! Bottom line: create Tension, feel the action inside, see it first in your head. Are you excited writing it? If yes, then your readers will feel the same way when reading it! 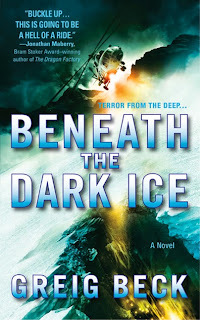 Matt Kerns, linguist, archaeologist and reluctant explorer from Beneath the Dark Ice and Black Mountain returns in his first full-time adventure. When a fame-hungry scientist brings an impossible, living specimen of a creature long thought extinct back from the wild jungles of South America he unwittingly brings along a passenger. Something with the potential to destroy every living thing on our planet. The infestation begins, rapidly overtaking medical resources and resisting all treatment. One woman knows the danger, Carla Nero, chief scientist of the Centre for Disease Control. She makes Matt an offer he can't refuse and together they join a team heading to the deep jungle in a desperate race to locate the hidden place where the specimen was taken. Only by finding the location of the specimen can the team – and the world – hope to uncover the secret of how to survive the ancient, horrifying parasite that has been released. Join the team, as they must travel deep into the dark heart of the Amazon’s Gran Chaco Boreal, where they find a world within a world and a place where mankind is out of time. There are monstrous dangers, and things defying belief, some from the worst of mankind’s nightmares. This title is a novella-length episode of The First Bird, available 1 June. The next episode will be released on 1 July and will conclude with Episode 3 and paperback on 1 August. Please visit www.momentumbooks.com.au for release dates, further information and to sign-up to be notified of the next release. I’m also working on the next Arcadian adventure, the final part of my Valkeryn series, and doing another iteration on the film script for Beneath the Dark Ice – busy times! Big thanks to Greig for stopping by. 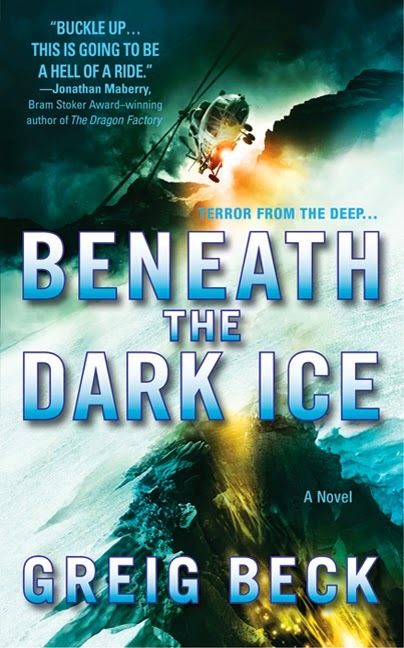 After reading Beneath the Dark Ice, I can honestly say that I will be reduced to a quivering blob of jelly after watching the movie adaptation. Looking forward to it!